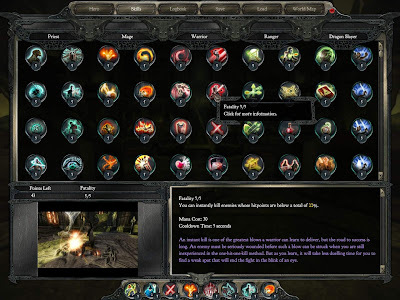 Synopsis: On Tuesday, my mailbox contained a review copy of Divinity II: Ego Draconis from cdv Software, so I figured I will provide our devoted fans with a review of the latest Action RPG for the Xbox 360. 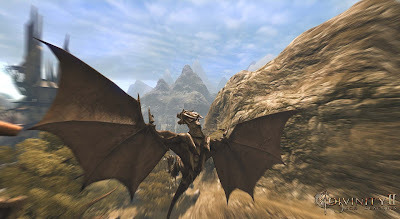 Claiming 60 hours of gameplay, Ego Draconis, allows the player to play as a customized character to complete a number of missions in becoming a dragon knight along with dungeon crawling or take to the skies as a dragon to rain death from above. The storyline adapts to the choices in which you make throughout gameplay, so there will be consequences for decisions made, resulting in different quest solutions and higher or lower pricing from vendors. There is also a new ability to this title from the original, where you get the ability to create your own creatures from body parts found throughout the game and once the creature is made, it will follow your commands similar to the way a Golem would. 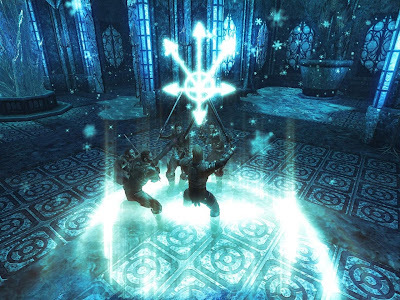 Praise: Ego Draconis has all the elements necessary to be a large and very strong RPG. Character and skill progression is a form of classless system that allows the player to determine the skills acquired throughout the story. Along with the character progression, I was given the ability to transform into a dragon and took to the skies for faster travel and battle, which was a good time, controlled nicely, and even felt that it was easier to target and take out enemies while in the dragon form and let's face it, who doesn't like dragons? The RPG elements that any fan of the genre enjoy are present in this title, being dungeon crawling, looting, level grinding, a fantasy filled story line, and a challenge. The challenge is what I liked the most as you simply cannot send your character into story missions without leveling up, even if the difficulty is on low. I found myself having to find and complete side missions along with level grinding until I felt confident my character could progress through the story. Gripes: Where this title exceeds at being everything necessary to be a good RPG, it does lack elements that make a game good. 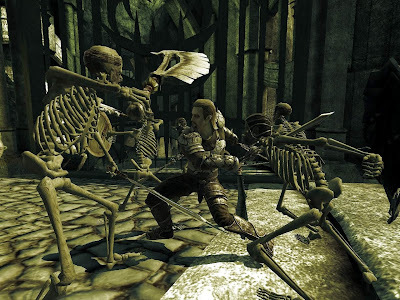 Hit detection is inconsistent when melee attacking enemies, where I would find myself flailing trying to land hits on goblins and nearby skeletons. Camera controls weren't bad however, the shakiness of the camera that was seen while trying to find a good place for the camera was headache inducing. Saving often is the best advice to give anyone starting this title as it does have an auto save feature, but if you choose to take on some of the side missions then you will learn it does not save often enough, because if you die, you will have to go back and play through from where the game last saved, most likely being the point where the last story mission was completed. Overall, Divinity II: Ego Draconis was a fun RPG, even though it does take some getting used to in order to get past the bugs present. It is a large game that will provide many hours of frustration and satisfaction each time you level up and complete missions. Last but not least, this game not only has dragons, but you are rewarded with the ability of playing as a dragon, creating your own minion from found body parts (your own medieval Frankenstein), and lastly your own piece of real estate, the dragon tower if you put in the hours of the RPG good stuff that any fan of the genre both loves and hates at the same time. 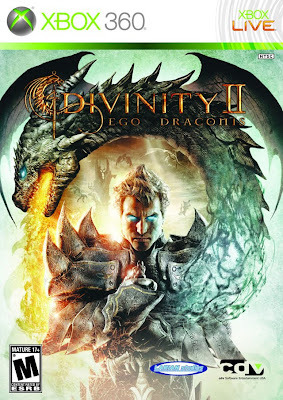 Divinity II: Ego Draconis is available now for the Xbox 360 and PC.